However, one of my favorite new features was the addition of Alerts on Classifications. In the past, you could set Alerts on Success Events and on eVar and sProp values, but not on Classifications of those eVars and sProps. While this new feature doesn’t sound all that impressive, it can be quite powerful. In this post I will demonstrate how it can be used. For the purposes of this post, let’s imagine that we have an eVar or Campaign variable that captures individual Traffic Drivers (Sources). These sources of traffic might be SEO keywords, Paid Search Keywords, E-mail links or clicks from Social Media sites. 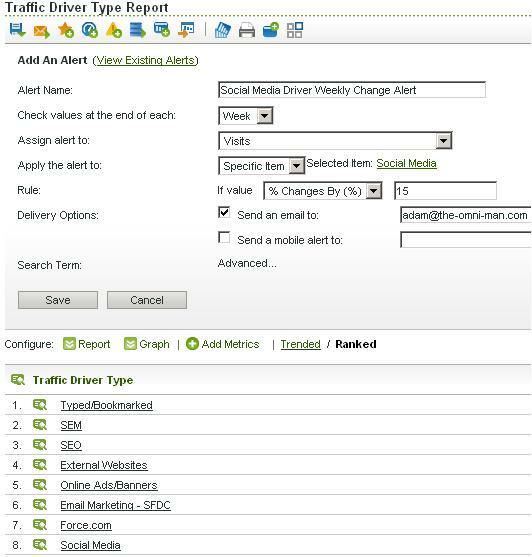 However, in this case, we don’t want to be notified every time there is a increase/decrease for a specific Traffic Driver, but rather, we would like to know if there has been a significant change to one of the higher level types (SEO, SEM, Social Media). Before this new version, doing that would be basically impossible, but this is easy now if you have used SAINT to classify your individual Traffic Drivers. Let’s say that your boss wants to be alerted if there is a significant change in Social Media referrals to the website from one week to the next. To be alerted about this, you would simply open up the Classification version of the Traffic Driver report (we’ll call it Traffic Driver Type) and click the Alert icon. Doing this brings up the screen below which is basically the same as the Alert screen you may have used previously. Once here, you can give your Alert a name, choose the time frame, pick your metric and then select the specific item you want to be alerted about (in this case I have selected Social Media). Next, you set the type of Alert – in this case I have chosen a percent change of over 15% and then tell SiteCatalyst how you woudl like to be notified (e-mail or mobile device). That’s it! These are just a few examples, and I am sure you will find many ones unique to your business that can prove beneficial. Just thinking about this I can think of one application that we could use it for. We frequently pass through gobbledegook values which appear in our CMS as s_props, e_vars and products. We then use the classification tools via an ftp from other tables in our CMS to turn these into ‘real’ values that the end user of SiteCatalyst can see and understand. This means that we can now set up our alerts against sensible names as opposed to the random codes (which someone would then have to look up).